Adaptation strategies to reduce smallholder farmers’ vulnerability to climate variability and seasonality are needed given the frequency of extreme weather events predicted to increase during the next decades in sub-Saharan Africa, particularly in West Africa. 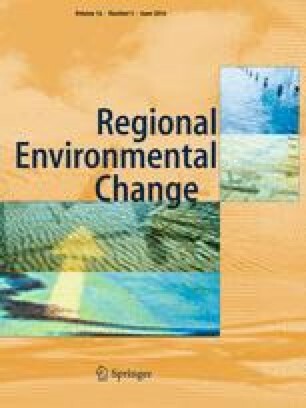 We explored the linkages between selected agricultural adaptation strategies (crop diversity, soil and water conservation, trees on farm, small ruminants, improved crop varieties, fertilizers), food security, farm household characteristics and farm productivity in three contrasting agro-ecological sites in West Africa (Burkina Faso, Ghana and Senegal). Differences in land area per capita and land productivity largely explained the variation in food security across sites. Based on land size and market orientation, four household types were distinguished (subsistence, diversified, extensive, intensified), with contrasting levels of food security and agricultural adaptation strategies. Income increased steadily with land size, and both income and land productivity increased with degree of market orientation. The adoption of agricultural adaptation strategies was widespread, although the intensity of practice varied across household types. Adaptation strategies improve the food security status of some households, but not all. Some strategies had a significant positive impact on land productivity, while others reduced vulnerability resulting in a more stable cash flow throughout the year. Our results show that for different household types, different adaptation strategies may be ‘climate-smart’. The typology developed in this study gives a good entry point to analyse which practices should be targeted to which type of smallholder farmers, and quantifies the effect of adaptation options on household food security. Subsequently, it will be crucial to empower farmers to access, test and modify these adaptation options, if they were to achieve higher levels of food security. The online version of this article (doi: 10.1007/s10113-015-0838-6) contains supplementary material, which is available to authorized users. We warmly thank the 600 survey participants for their time and responses during the long hours of the interviews, and the 20 enumerators and data entry clerks who conducted the household survey in the three countries. We gratefully acknowledge the assistance in cleaning the data base by four students. CCAFS is funded by the CGIAR Fund, AusAid, Danish International Development Agency, Environment Canada, Instituto de Investigação Científica Tropical, Irish Aid, Netherlands Ministry of Foreign Affairs, Swiss Agency for Development and Cooperation, UK Aid, and the European Union, with technical support from the International Fund for Agricultural Development.